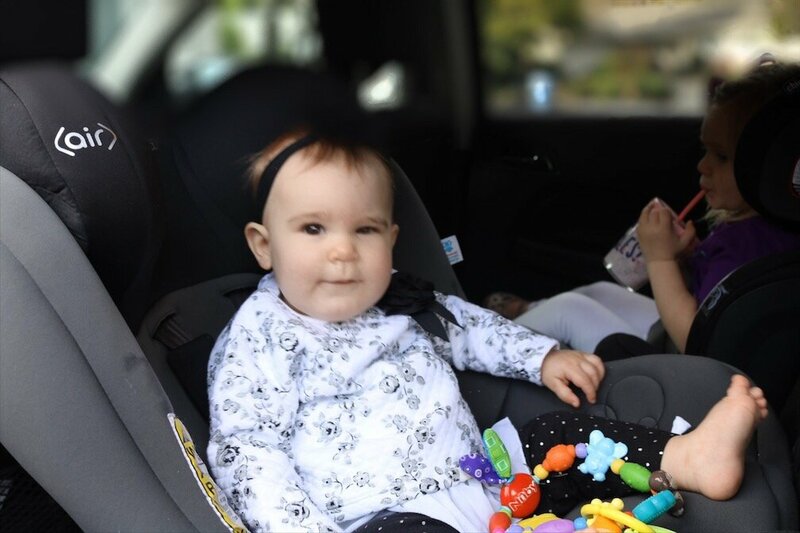 A couple of months ago we realized Amelia was getting too big for the carrier car seat. So I decided it would be best to put Amelia in Aria’s convertible car seat, which she’s been in since she was about nine months old, and get Aria a new toddler convertible car seat. So to get started I looked at Buy Buy Baby to get an idea of what I wanted. I knew I wanted something that had the tall back, but could be just a booster later on. I found the perfect one, The Chicco KidFit Zip 2-in-1 Belt-Positioning Booster Car Seat. I love it’s convertible, has a drink holder and came with a storage attachment (this is Aria’s favorite thing). Anyway, Aria, being the 3 year old that she is, sometimes has this mindset that things are hers and can have a hard time giving something up. She is also very much like me and can be very stubborn, so I wasn’t sure how telling her Amelia was going to start using her seat and she was going to use a different one would go. Well I brought the new one home and told her I got her a new big kid seat for Mommy’s car. I let her help me open the box, put it together and then took her for a little ride to have her try it out. She LOVED it. It was much easier for her to get in and out of it, she likes that she can help buckle and unbuckle herself and loves the storage attachment (for her snacks and toys of course). So, if you’re looking for the next transitional car seat, I’d recommend the Chicco KidFit. Another great bonus about shopping at Buy Buy Baby is using the 20% off coupon. Mom Hack Tip: if you don’t have a current Buy Buy Baby coupon, take your receipt to Bed Bath & Beyond with one of their coupons and they will refund the discount! Thanks for stopping, I hope you have a fantastic week!